Buy the Xbox One S Shadow of the Tomb Raider Bundle and become Lara Croft in a race to save the world from a Maya apocalypse. Master the deadly jungle, overcome terrifying tombs, and persevere through Lara Croft’s darkest hour. Xbox One has over 1,300 great games including today’s blockbusters, 200 console exclusives, and 400 classics. Whether you’re playing your favourite games, watching 4K movies, or streaming gameplay, there’s never been a better time to game with Xbox One. 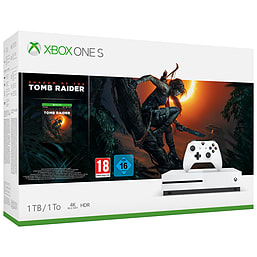 Xbox One S 1TB console, wireless controller, full-game download of Shadow of the Tomb Raider, 1-month Xbox Game Pass trial with access to over 100+ games, and 14-day Xbox Live Gold trial. Become Lara Croft in a race to save the world from a Maya apocalypse. Master the deadly jungle, overcome terrifying tombs, and persevere through Lara Croft’s darkest hour. Whether you’re playing your favourite games, watching 4K movies, or streaming gameplay, there’s never been a better time to game with Xbox One.